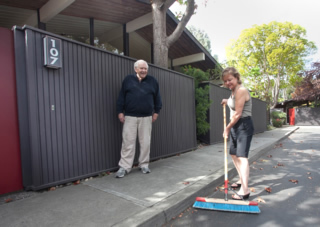 Everyone at Meadowcreek has a role and responsibility, including longtime residents Nancy Kukkola (right - landscaping) and Jim Dougherty (unofficial gatekeeper), who once worked for Eichler Homes. A bird's eye view of the complex and carport. 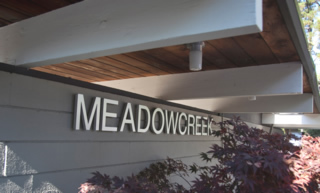 If ever an Eichler neighborhood needed a gatekeeper, it's Meadowcreek, a hidden, little enclave of one-story condos in Palo Alto. The folks who live there share party walls, which means they can sometimes hear things they'd rather not, like phones ringing or muffled talk. They meet each other in the central carport, and at the pretty, little pool surrounded by red maples and junipers—though the pool can be a place to get away from society, too. "With only 17 units," young lawyer and newcomer Tom Spahn says, "you basically always have it to yourself." But when the pool is really fun, neighbors say, is when they're all there, for this is a neighborhood that knows how to carry on together. A fall pool party saw colored lights, a fireplace, and wine chosen by a couple of dining professionals who live in the complex. And a progressive holiday dinner from a few years back has become legendary. "It was one of the wildest parties," says Jenny Quigley. "It was really fun." The fun, however, can be tinged with tension. "What am I going to bring?" Susan Harness worries whenever a potluck is planned. "The men are the gourmet cooks," she says. "It's pressure. What to bring? I thought I had to bring something fabulous." Not only do neighbors play together, but they work together as well, managing the complex themselves through their homeowners association and performing hands-on chores. The units occupy three buildings built around a parking area with a carport, making efficient use of about 1.2 acres. "Everybody volunteers in the neighborhood," says Nancy Kukkola, who's lived there 32 years and does landscaping. "Everybody has different responsibilities." "Volunteering isn't required," she says, "but people do volunteer." Vijnan Shastri, an electrical engineer turned software engineer, handles simple electrical chores. When neighbors notice advantageous dips in mortgage rates, Tom says, "I'm the refinance guy." 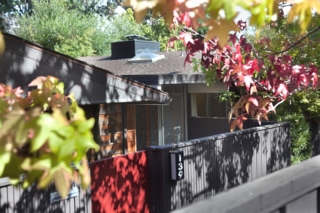 When neighbor Sharon Dougherty spied graffiti along the fence that separates Meadowcreek from the real world, she mentioned it, a bit more than casually, to Vijnan and Tom. "They said, 'We'll paint the fence this weekend.'" Jenny and Tom have constituted themselves as a 'green team,' looking into the potential of providing solar power for the currently unheated pool, or a plug-in station for electric hybrid cars. 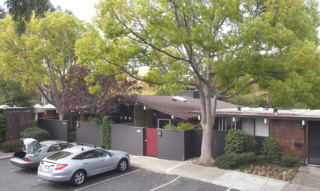 When a lady in the neighboring Eichler Greenmeadow subdivision of single-family homes insisted on boosting the squirrel population by feeding them, to the dismay of Meadowcreek gardeners, their association president, Felicia Fahey, stepped in. "It was Felicia's mission for about a year," says Rania Bratberg, Vijnan's wife. "When she gets hold of a mission, there's no stopping her." And when interpersonal issues arise, neighbors call on Susan Harness, whose career teaching kindergarten has taught her much about human nature. "Apparently my role is to be the 'conflicts person,'" she says, adding, "It's like a really easy job." "We're all committed to making this place a great and comfortable place to live," Tom says. "It's a good group," says Rania.